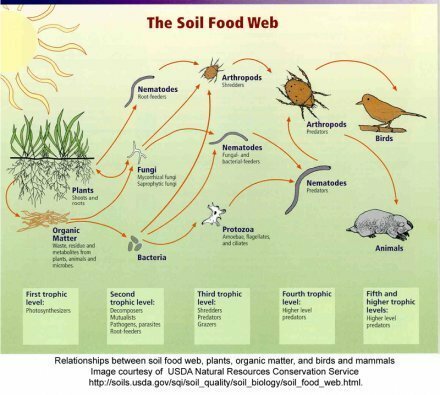 What is the difference between soil and dirt? The trouble is, GMO seeds produce feed and fuel, not food. Over the last 20 years they’ve yet to feed any of the planet’s poor or hungry. In any case, the world already produces enough food for 10 billion people, so simply increasing production clearly won’t end hunger. The World Food Prize’s love affair with biotechnology not only elides the structural causes of hunger; it ignores the documented successes of agroecological methods for building in farm-scale resiliency and ensuring productive, sustainable yields. The World Food Prize has become a corporate celebration of self. In addition to Syngenta, Pioneer and Monsanto, the foundation’s donor list includes Cargill, ADM, Walmart, Pepsi, Land O’Lakes, the American Soybean Association, the Iowa Soybean Association and the Iowa Farm Bureau. Biotech boosters Howard Buffet and Rockefeller foundations each gave a cool million bucks; the Monsanto-friendly State of Iowa gave $1.4 million. Even The New York Times suggested that this award may be a PR attempt to counter the growing global backlash against GMOs. It is also an effort to fibrillate the industry’s flat economic performance that has followed the heady days of the 2008-09 food crisis (in which they made record profits while a billion people were pushed into the ranks of the hungry). Apparently the way to revive lackluster seed monopolies is to guarantee them a monopoly on ending hunger. But giving the World Food Prize to the monopolies profiting from hunger is like awarding the Nobel Peace prize for going to war… wait, that’s already been done. So it goes. It is no wonder farm and food activists have established the Food Sovereignty Prize to celebrate organizations working to democratize—rather than monopolize—our food system. While the World Food Prize emphasizes increased production through proprietary technologies, the Food Sovereignty Prize rewards social and agroecological solutions coming from those sectors that are most negatively impacted by the corporate food regime. Given by the US Food Sovereignty Alliance, this prize, first awarded in 2009, has been given to honorees that include the MST—Landless Workers Movement of Brazil (2011), Family Farm Defenders (2010): La Via Campesina (2009) and honorable mentions like the Movimiento Campesino a Campesino (Farmer to Farmer Movement), as well as urban organizations like the South Central Farmers of Los Angeles, the Detroit Black Community Food Security Network and the Toronto Food Policy Council. We are on our way to making this film a reality! We’ve reached 75% of our goal. Show your support and spread the word! About three years ago, South Los Angeles resident Ron Finley got fed up with having to drive more than half an hour to find a ripe, pesticide-free tomato. So he decided to plant a vegetable garden in the space between the sidewalk and street outside of his home, located in the working-class neighborhood where he grew up, surrounded by fast food restaurants, liquor stores and other not-so-healthy options. When the City of Los Angeles told him to stop, based on the old laws that said just trees and lawn could be planted on those skinny strips of urban land, Finley, who is a fashion designer and Blaxploitation memorabilia collector by day, quickly rose to fame as southern California’s “guerilla gardener.” By founding a nonprofit called L.A. Green Grounds, whose monthly “dig-ins” feature hundreds of volunteers turning overlooked pieces of urban land into forests of food, Finley became the face of a public campaign against the city, which owns roughly 26 square miles of vacant lots that he believes could fit nearly one billion tomato plants. The city listened, and is now in the final stages of changing the rules to allow fruits and veggies to be planted along sidewalks. “I’m pretty proud of that,” said Finley, who recently answered a few more questions for Smithsonian.com. Earthworking is inextricably tied to harnessing the energetic exchange of water in the landscape quite often in Permaculture. It also sets the framework for garden bed or food forest creation. The earthworks often involve machinery but ultimately the shovel and human hand finishes it off giving the necessary edge and permanence it deserves. Below shows this phenomena exactly as the beds had been created by machines to create a serpentine flow of water in a run, riffle, pool pattern. This flow was accompanied by a sinuous shape of raised beds following the path of the ditch created to channel and harvest the tremendous amount of seasonal water flow. After the inherent re-evalatuion process that comes with Permaculture design and managemetn of systems, we reworked these beds to garner better access and create more beds space at the same time through creating keyhole garden beds. 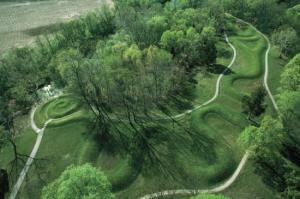 Earthworks have long been used for agricultural or spiritual purposes whether it is the Minho Valley in the north with its extensive terracing or in South East Ohio, USA with Serpent Mound. The later is 400 m (quarter mile) long earthwork that shows remarkable solar/lunar accuracy built within a meteor impact zone. It shows patterns and once was hoe to sacred worship and honoring the rhythms of natural cycles. This is one of the greatest architectural achievement on planet earth and is just one in a series of extensive earthworks that the mound building woodlands culture of this area erected. Inside artifacts of tremendous value were found like wood effigy pipes and extremely intricate and pinnacly amounted shaped copper. Food Myth: Do we really need industrial agriculture to feed the world? 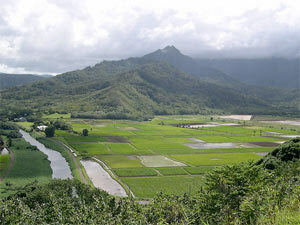 This month, the pesticide industry has been showing its muscle in Hawaii. The “Big 6” seed and pesticide corporations — and their front groups — have undermined two public efforts to provide better information about pesticides and genetically engineered (GE) seeds and foods. Industry successfully undermined two GE-related bills in the state legislature. One requires labeling of genetically engineered foods. The other requires pesticide applicators to keep track of and report use of hazardous pesticides, providing valuable data on how much GE crops are driving up the use of pesticides. But both are now much weaker than they started out. 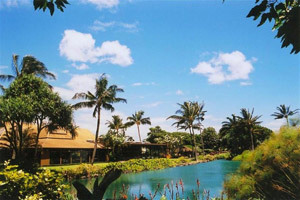 Through extensive lobbying and public relations, DuPont, Monsanto and the so-called Hawaii Crop Improvement Association (an arm of CropLife) convinced legislators to amend the bills so that it would be decades before people would get information on pesticide use. And labeling would be limited to GE crops from other places. The weaker bills are being taken up in additional House committees later this week before they move on to the Senate for consideration. It’s an exciting time for the good food movement. Sometimes it can feel as though the efforts to make agriculture more sustainable are the most visible and active component of the broader environmental movement. This shouldn’t be surprising. Our relationship to food is visceral, emotional, and continues daily. Climate change, as important as it is, can feel abstract. If you’ve seen Food Inc. or read any Eric Schlosser, Michael Pollan, or Rachel Carson, you know that the sustainable food movement is trying to address the social and environmental problems created by an industrial farming system in which convenience and profit trump everything else. The responses to industrial farming have included critiques like Silent Spring, the back-to-the-land and organic farming spark of the late 1960s, the family farm movement that resisted bankruptcy and corporate consolidation in the 1980s, and now the urban farming movement that has burgeoned during the past 10 years. Many elements of the sustainable food movement have been organized by (or organized for) the two most obvious sectors of the food system: eaters and producers. 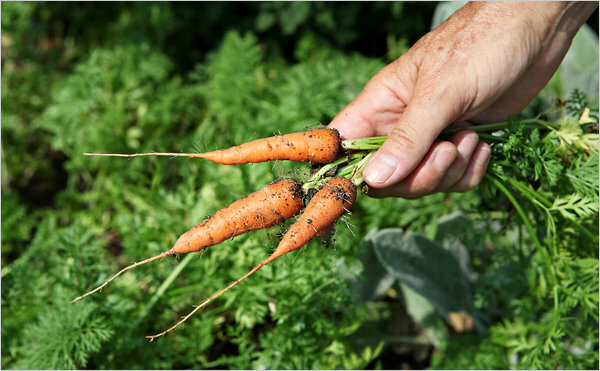 Generally food activism has revolved around those who grow the food and those who eat it. In parts of the world where populations are still largely agrarian, eaters and producers are often the same people, but here in the United States (where the farming population hovers around 1 percent) consumers have been the dominant focus of food policy, at least for the past 40 years. 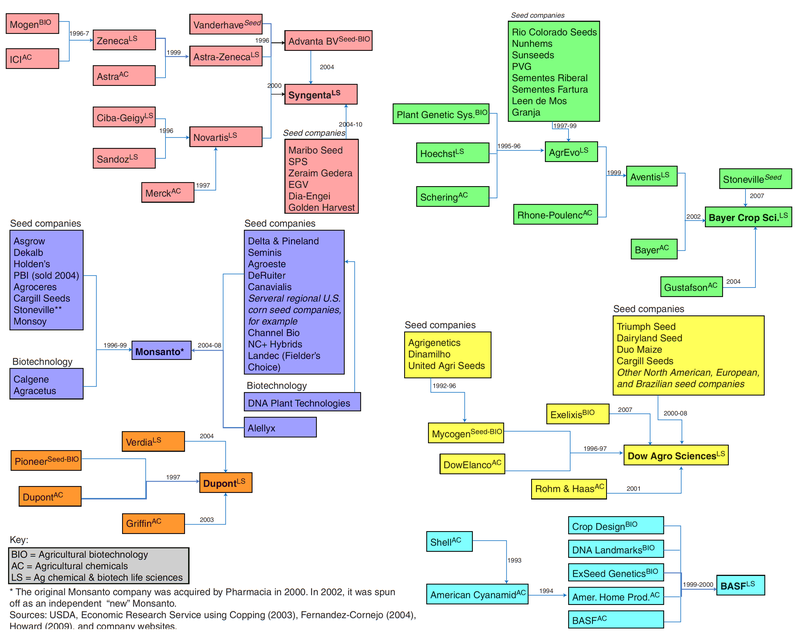 Industrial food production, which currently dominates U.S. agriculture, is a dead end. It damages air, water and soil, harms rural communities, and limits future productivity. But there’s a better way. 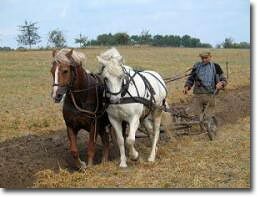 Scientists call it agro-ecological agriculture. We call it healthy farms. Healthy farms can be just as productive as industrial farms—and a lot more sustainable. 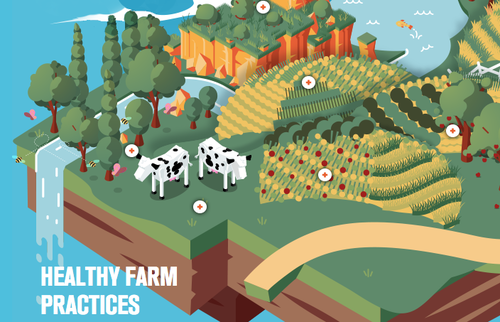 Check out the infographic about healthy farm practices made by the Union of Concerned Scientists.